Background: Several Chlamydia pneumoniae (Cp) biomarkers have been associated with asthma but Cp-specific IgE (Cp IgE) has not been investigated extensively. 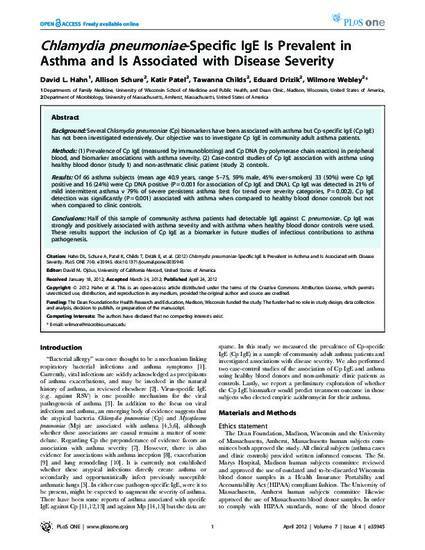 Our objective was to investigate Cp IgE in community adult asthma patients. Methods: (1) Prevalence of Cp IgE (measured by immunoblotting) and Cp DNA (by polymerase chain reaction) in peripheral blood, and biomarker associations with asthma severity. (2) Case-control studies of Cp IgE association with asthma using healthy blood donor (study 1) and non-asthmatic clinic patient (study 2) controls. Results: Of 66 asthma subjects (mean age 40.9 years, range 5–75, 59% male, 45% ever-smokers) 33 (50%) were Cp IgE positive and 16 (24%) were Cp DNA positive (P = 0.001 for association of Cp IgE and DNA). Cp IgE was detected in 21% of mild intermittent asthma v 79% of severe persistent asthma (test for trend over severity categories, P = 0.002). Cp IgE detection was significantly (P = 0.001) associated with asthma when compared to healthy blood donor controls but not when compared to clinic controls. Conclusions: Half of this sample of community asthma patients had detectable IgE against C. pneumoniae. Cp IgE was strongly and positively associated with asthma severity and with asthma when healthy blood donor controls were used. These results support the inclusion of Cp IgE as a biomarker in future studies of infectious contributions to asthma pathogenesis.